“California Flower Pop.” That’s how famed guitarist/producer Pete Anderson described this artist's second CD. Blending raw, stripped-down guitar with mournful organ lines, cheery melodica, seductive pedal steel makes this record jump out of the speakers. “California Flower Pop.” That’s how famed guitarist/producer Pete Anderson described Erin O’Bryan’s second record, ‘Trip To Horizon’. And an apt description it is. Erin O’Bryan is a singer/songwriter with an amazing gift for storytelling, with many of her songs describing the rich and multi-layered world of Los Angeles and interweaving the universal experiences of life and love. O’Bryan comes by her California roots rock foundation honestly, having grown up in Southern California and experiencing the exploding music scene in Los Angeles in the late ‘70’s and ‘80’s. Erin says ‘It’s kind of like submersion education’. By cutting her teeth in the L.A. club scene in her teens and honing her craft in some of the most famous venues known to rock fans world-wide, Erin was able to draw upon a vast live performance experience to indulge in her favorite pastime; writing great songs. Erin released her debut CD ‘Walk With The Saints’ in 2003 and toured for three years , all the while writing prolifically and planning for her next record. Trip To Horizon marks the first collaboration between Erin and producer-engineer Sally Browder, who, having worked with The Humpers, Exene, The Plimsouls, and Dwight Yoakam had an immediate impact on O’Bryan’s songs by putting to work her vast experience in rock, punk, alternative and country. Interweaving the distinct sounds of Celtic/punk guitar genius Bob Boulding of The Young Dubliners, blues guitarist/Grammy Award winner Pete Anderson (Dwight Yoakam, Roy Orbison, K.D. Lang), pedal steel wiz Bob “Boo” Bernstein (Freddy Fender, James Intveld) and keyboard virtuoso Jamie Muhoberac (John Mayer, Seal, My Chemical Romance) helps give Trip To Horizon a punch not typically seen on many ‘second records’. Inspired by O’Bryan’s inventive songs and guided by Browder’s spot on production, this diverse group of influential artists laid down a bedrock of sound, juxtaposing raw, stripped-down guitar riffs with mournful organ lines, cheery mellodica with sometimes plaintive, sometimes seductive pedal steel to make this record jump out of the speakers. O’Bryan weaves her tales over this unique foundation with a voice reminiscent of Chrissie Hynde and Stevie Nicks, with an ease that takes the listener on a magical journey through the landscapes of her mind. Trip To Horizon is the result of a three dozen song writing tear from which the final twelve were chosen. Says O’Bryan with a laugh, “It’s a little like choosing which of your children you like the best and which ones don’t get to sit at the table”. Erin O’Bryan seems to never stop creating. Always with pen in hand and guitar nearby, Erin feels that songwriting is a bit like gold mining. “You have to turn over a lot of rocks to find the shiny stuff”. 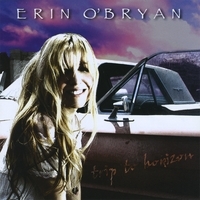 From the fantastic reviews of her first CD and her live shows to the early responses to Trip To Horizon (released May 1, 2008), music lovers are united in their assessment that Erin O’Bryan is a musical force to be reckoned with. “The honesty in her lyrics is a quality which I think she has an advantage over the other mentioned artists.